Tarantulas and Trapdoor Spiders Archives - Page 3 of 27 - What's That Bug? 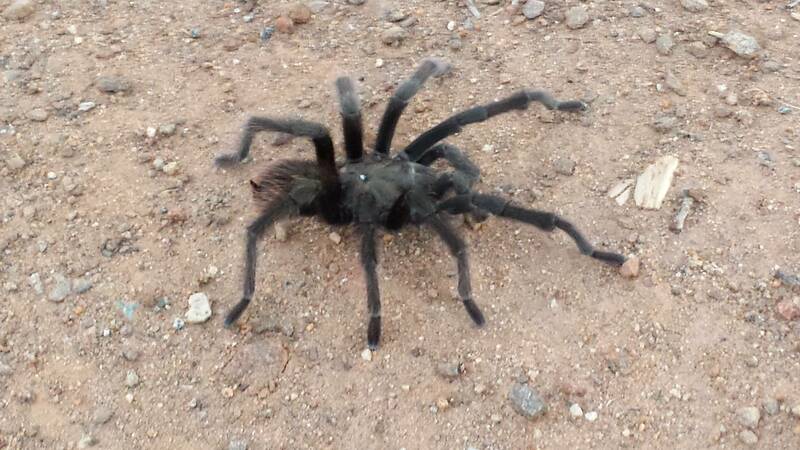 My dad came across this spider at the mine where he works. It was on a piece of machinery. This is indeed a Tarantula. The only species reported from Utah on BugGuide is Aphonopelma iodius. Greetings! Long-time reader and fellow entomomaniac here. I have a friend who found this fellow around her home in East Texas in September. I’ll admit that my arachnid knowledge is lacking; my best guess was that it was a juvenile tarantula that had recently molted, but that’s as far as I’ve gotten. Any assistance would be greatly appreciated! This is not a Tarantula, but it is a Trapdoor Spider that is classified along with Tarantulas as a primitive spider in the infraorder Mygalomorphae. We will attempt to provide you with a species identification. Sounds good! Thank you very much for your help! Could you tell me what this spider is? Running with my dog in Westridge Park and almost stepped on this big harry guy! Tarantulas are reluctant to bite, but should one decide to bite, it might be painful and might produce a local reaction. The venom is not considered dangerous, however, Tarantulas do have urticating hairs that could cause an irritation. According to Amateur Entomologists’ Society: “Urticating hairs are possessed by some arachnids (specifically tarantulas) and insects (most notably larvae of some butterflies and moths). The hairs have barbs which cause the hair to work its way into the skin of a vertebrate. They are therefore an effective defence against predation by mammals.” These hairs are much more likely to cause problems than a bite, and a nose-full of urticating hairs would not be a pleasant experience for Finn and it might require a trip to the vet.